When a video game title receives both a console and handheld iteration, it's fairly common for them to feature unique gameplay, different art styles, and generally offer a fresh experience across the platforms. 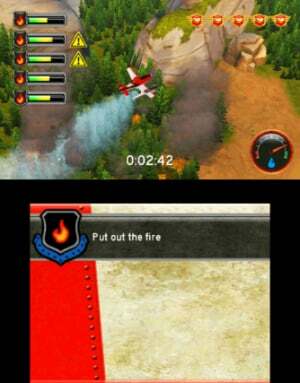 Instead, Disney Planes: Fire & Rescue for the 3DS is almost identical in every aspect to its Wii U counterpart. Unfortunately, it's also just as unremarkable. Taking control of Dusty — the once famous aerial racer-firefighting plane, you serve to prevent the forest fires that threaten the Piston National Park on a daily basis; Dusty's training at the Piston Park is necessary for him to qualify as a fully certified firefighter. Due to the lack of a story mode, you are dropped straight into the training missions without any back story or explanation. 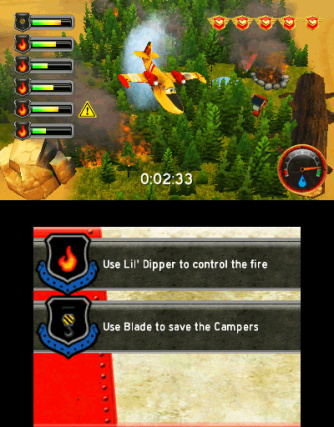 Training missions can be ignored in favour of diving straight into the regular fire & rescue missions, but with thirty of the game's stages being training and academy missions and only twelve being unique Fire & Rescue story missions, you'll be avoiding a huge portion of the content in doing so. The rather generous number of levels may seem satisfactory at first, but after playing four or five of the missions the lack of variety becomes obvious. Putting out forest fires, guiding stranded camper vans and airlifting stranded hikers to safety soon becomes repetitive, as one mission soon blurs into another. The real challenge lies in how quickly each mission can be completed. Each completed level is ranked with either a bronze, silver or gold medal, depending on your total clear time. Despite the levels being easy enough to finish, the repetition of each one offers no real incentive to replay, especially as the sole rewards come in the form of unlockable movie stills. At times, simply finishing the stage and being able to shut off the system for a breather is a reward in itself. Occasionally there is some variation, as certain missions allow you to control a number of Dusty's friends. Sadly, this is only the case when you're prompted to do so, and you are not allowed to freely choose who you play as at any point. Many of the other planes and vehicles lack any truly unique traits or abilities over Dusty, making their inclusion a bit of a waste. Windlifter winches objects, and Dipper is smaller and more agile than Dusty, but generally they all still do the same job: collecting water and dispersing it over burning trees. 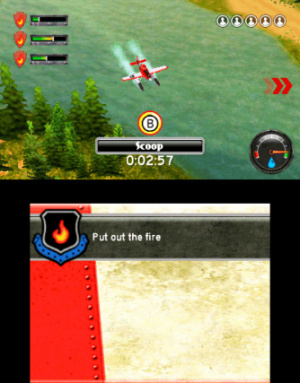 The Smokejumpers (a team of construction vehicles) offer a slightly different style of gameplay when they appear, however, mashing the B button or frantically rotating the control stick round and round in order to remove boulders and rubble is about as riveting as their segments get. 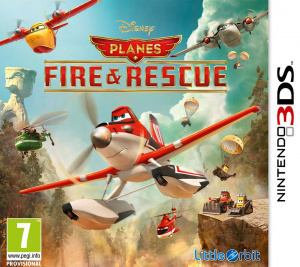 Graphically, Disney Planes: Fire & Rescue is not a terrible looking title, but it suffers by going with the same visual style as the Wii U version instead of opting for a more stylised look. The stereoscopic 3D can be enabled, causing the HUD to pop out from the background, but flying around doing loops as Dusty in 3D makes for quite the nauseating experience, and soon you'll find yourself searching for an airsickness bag. The accompanying score, whilst rousing and enjoyable, soon becomes tiresome, and the voice acting (or lack of) doesn't come off a great deal better either. Audio is pulled straight from the movie, and at times, is barely audible. Coupled with the lack of cutscenes, the entire package feels somewhat rushed. It's tough to score Disney Planes: Fire & Rescue on 3DS any differently to its Wii U counterpart due to it being a near carbon copy. One may expect the Wii U version to be the superior game, but in reality both are almost identical. The portable title lacks the visuals and sheen of the Wii U version, but very little else can be chalked up between the two. Regrettably, this means that Disney Planes: Fire & Rescue for the 3DS is just as lacklustre, and offers very little cause for completion. Younger children could easily stomach the experience enough to put countless hours into the game and will enjoy the references to the movies. Anyone else, on the other hand, will struggle to maintain any real determination to play past the first few missions, and will instead find themselves grasping for the "eject" switch fairly early on. Unsurprising. Anyone who wants it might as well buy the 3DS version and save $30. Subtitle should read "crash landing."